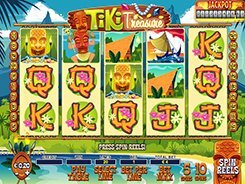 Tiki Treasure is a NYX-powered video slot with 5 reels, 20 paylines and a huge 2000-coin jackpot. High-limit players are sure to love this game since the maximum stake reaches a staggering $2000 per spin. The slot is themed around Maori people, their mythology and culture, so the reels are populated with a smoking volcano, a Maori man playing the drums, a toucan, a dancing tribesman, etc. Tiki Treasure has a Scratch Ticket bonus feature unlocked by 3+ Bonus symbols. The bonus game takes you from the reels window to the second screen where you are shown nine tiki statuettes, and you are to pick them to reveal instant prizes that may amount up to 3000 coins in total. Along with that, you may take advantage of a free spin round if you line up three or more Dancing Maori Women on a payline. A wild (a man wearing a big mask) is another symbol that you will want, as it helps create winning combos by substituting for missing icons. PLAY FOR REAL MONEY!